$199.99 $129.99 35% off *Discounted price shown in red box. If no color is chosen, Sleeve color will be chosen randomly. 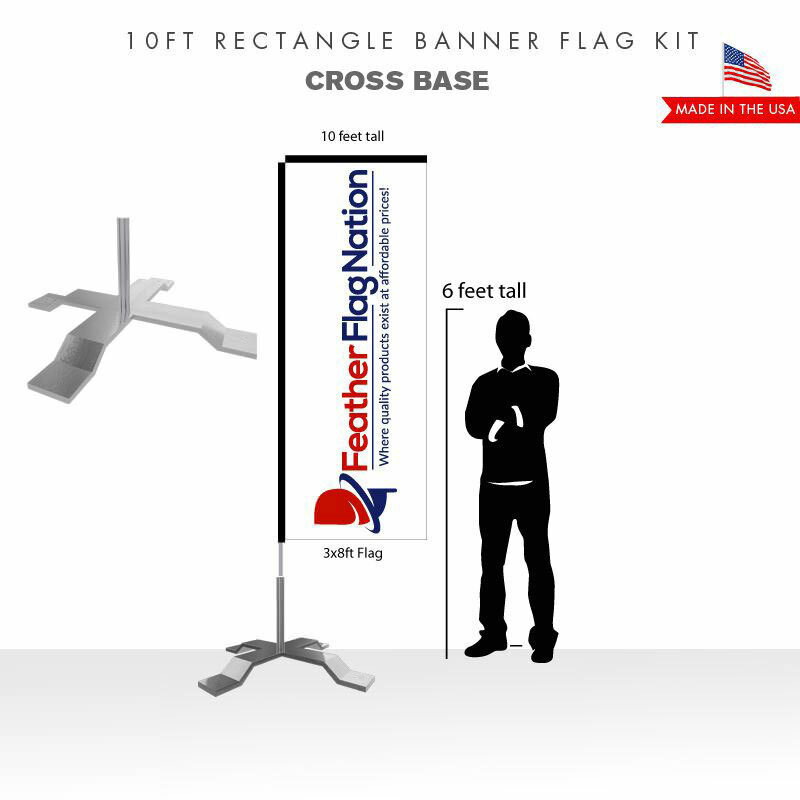 This 8ft rectangle banner flag kit comes with everything you need for a quick and easy assembly. The pole kit included in this set stands at 8ft tall. The custom rectangle banner is a height of 6ft. The hardware mount that comes as part of this kit is a ground spike which can be used in grass, dirt, or sand. 8ft Tall Rectangle Flag Kit With Ground Spike Base is the kit for you! If you’re looking to use your custom rectangle advertising flag indoors or on hard surfaces (concrete, tile, hardwood, etc. ), it best to purchase the cross base mount. The ground spike is used outdoors only. 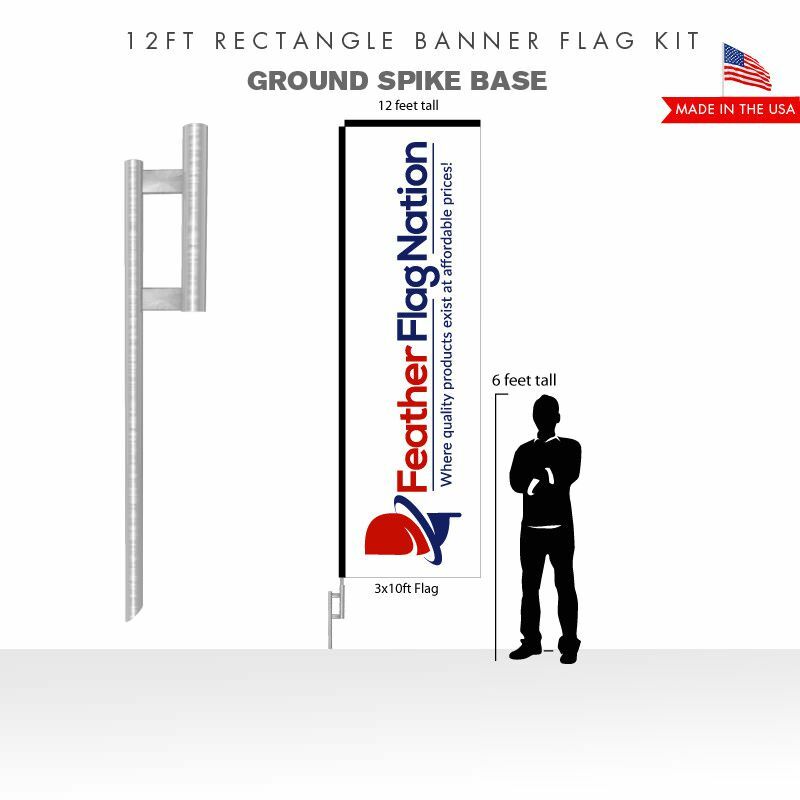 The 8ft pole kit/6ft flag is the smallest size kit we offer at Feather Flag Nation. This is a great compact size. This a great option for outdoor use in cities/neighborhoods that have height restrictions on advertising flags. If you’re familiar with our popular “Welcome” real estate feather flag sets, this kit is the same size. 8ft Tall Rectangle Flag Kit With Ground Spike Base. This is a great flag to use if you have a height limit or only have a limited space to display your flag. 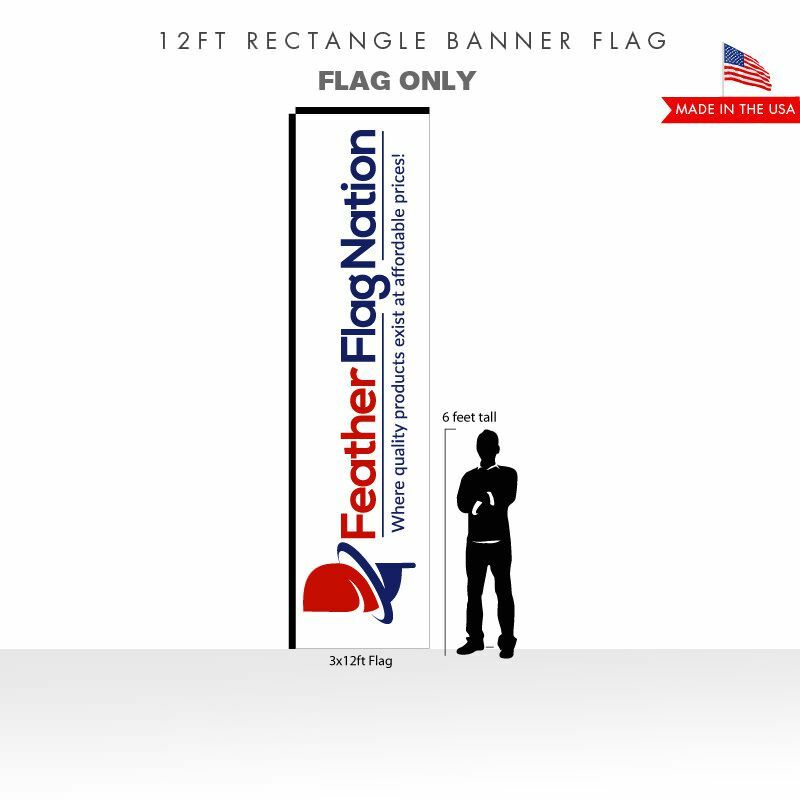 Choose Feather Flag Nation for high quality custom feather flags. Our team of graphic designers is here to help design your flag. Proofs are sent within 24 hours for approval. 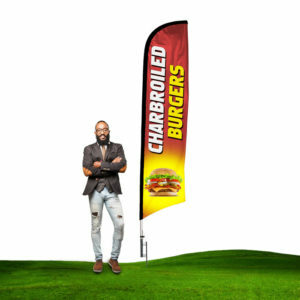 If you have a logo or design ready, download one of our feather flag templates. There are many ways to customize your flag! If you have any questions or concerns, call us or email us and we’d be happy to help. 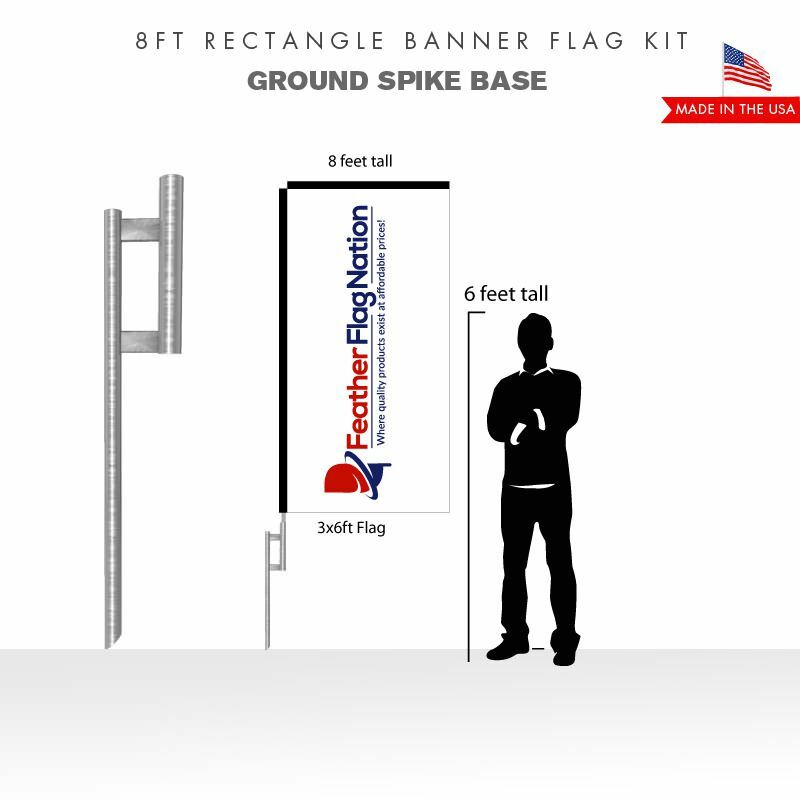 Get your 8ft Tall Rectangle Flag Kit With Ground Spike Base today! Rectangle flags at the indoor shops of the Pomona County Fair. 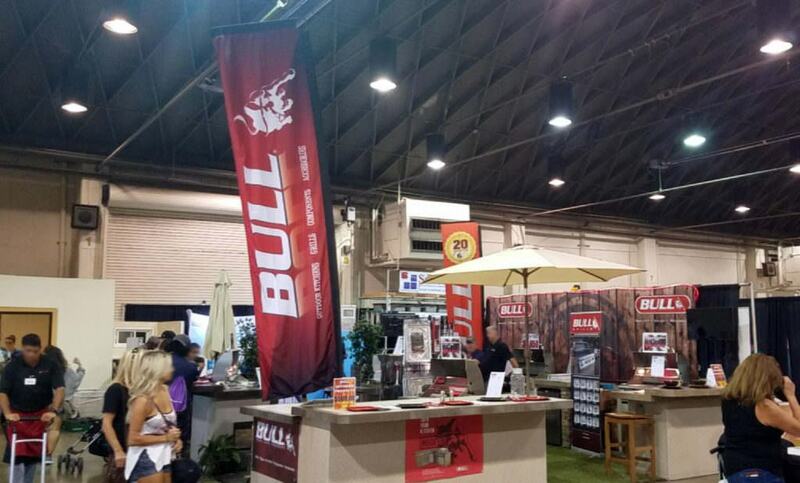 Stand out from the rest with these highly visible flag banners. Please Note: This feather flag is NOT designed for use in high winds. Long term outdoor use is okay. Take inside during severe weather or high winds. This item can be picked up from our production location. For local pickups, please contact us. This item will ship via UPS, FedEx, or USPS. Our center will decide the most cost efficient method. Express shipping options available for this product. Contact us for rush orders. Rush orders must be confirmed. Product does NOT ship on a same day basis. It has a delayed shipment. This custom product typically is crafted and shipped within 2 to 3 business days (1 to 10 quantity). Times will vary for larger quantities. For any question regarding product time, please contact us. This product is built to order. Accessories, finishes, designing, logos and/or graphics are added to this custom product to complete your order. Production clock begins once your artwork and payment is finalized. You are required to provide us with any necessary files (logos, live images, fonts, etc) that are required to do your layout. We will create your layout free of charge. We cannot guarantee any color matching. It is highly advised to provide us PMS or CMYK color codes. Our machines tend to match them fairly well. RGB colors cannot be used. No returns will be accepted for color variance. If you are creating your artwork, please review the artwork/graphic guidelines and templates linked to in the downloads section before placing your order. Instructions for submitting your artwork/graphics are provided within the guides. We cannot be responsible for orders that are delayed due to artwork/graphics which do not meet the provided requirements.